Visit my Zibbet Shop to see all my creations! Naturally Dyed Silk Scarf 8″x 54″ Hand Dyed. Simple, Elegant, Natural! This one of a kind, silk scarf will dress up any outfit. Hand dyed with wild geranium and rose leaves. 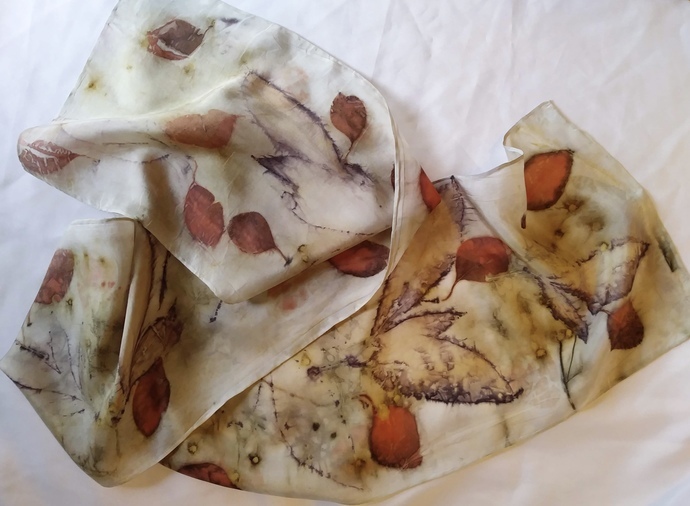 Colors and prints on this scarf made by transferring pigments and images of actual leaves onto a blank silk scarf. Wrap the scarf (covered with leaves) tightly around a dowel. When cool, unroll scarf from the dowel. Peel leaves from the fabric. The result – a unique one of a kind scarf! Hand wash in cool water with a mild soap. Hang dry or iron using the silk setting. Organic elements, color may vary slightly over time. Items generally sent USPS, and will be mailed within 3 days of the purchase. I ship to all locations. Any over charges on shipping refunded through Paypal. Return to My Shop here or Visit my Zibbet Shop to see all my creations! My name is Heidi and I live in Wisconsin just over the Minnesota border. I love making stuff and I especially love making messy stuff! Currently I spend much of my time gathering leaves, blossoms, plant or natural materials from the great outdoors, whether it be my garden or a local park and I then use these items to print and/or color fabric and occasionally my hands (I do recommend wearing gloves). Since every item I make uses actual plant material in some form, none of my creations will ever be exactly alike! And…I’m not limited to printing with nature. Check in every now and again and there may be some other mediums that I’m using. So mysterious I am. Thanks for looking! If you have any questions send me an email!